Imagery analysts. Photo: U.S. Air Force. Hundreds of private sector intelligence analysts are being paid to review surveillance footage from U.S. military drones in Central Asia and the Middle East, according to a new report from the Bureau of Investigative Journalism. “Contractors are used to fill the gap to give enough manpower to provide flexibility necessary for military to do things like take leave,” one analyst who worked with the Air Force at Hurlburt Field airbase in Florida, told the Bureau. 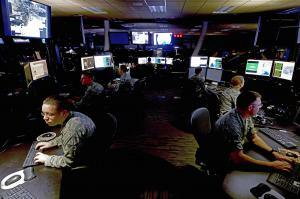 Private companies have been providing support for military intelligence for many years. Ever since CACI’s role in supplying interrogators at Abu Ghraib came to light in 2004 http://www.corpwatch.org/article.php?id=10828, CorpWatch has regularly documented dozens of companies like BAE Systems, Booz Allen Hamilton, L-3 Communications and SAIC that have provided such services to the federal government ranging from surveillance equipment and weapons to propaganda experts and imagery analysts. Today, these contractors are flocking to the drone business, which has become the linchpin of President Barack Obama’s military strategy, just as the ground war has wound down. Although the Central Intelligence Agency has garnered most of the media attention for targeted killing delivered by drones in countries like Pakistan and Yemen, the bulk of the so-called “War on Terror” is really conducted by U.S. Air Force pilots and support personnel who fly 65 round-the-clock “combat air patrols” of Global Hawk, Predator and Reaper drones around the world from faraway locations. Each of these patrols, which involve three to four aircraft, require as many as 186 individuals who staff a complex and global system. Typically pilots and camera operators work out of bases like Creech in Nevada, while maintenance crews work in friendly countries like Afghanistan and Saudi Arabia. Video analysts work out of military bases like California and Florida while military lawyers who are required to approve strike decisions are stationed at the Al-Udeid base in Qatar. Imagery analysts who review video footage are among the lowest ranked among the personnel who work in the drone war hierarchy. Typically these are entry level “airmen” who only need a high school diploma and eleven months of military training. The drone pilots are officers with undergraduate degrees and more years of training. Both airmen and officers become eligible to work as private contractors after they complete their military service, where they can be paid twice as much for the same work, and get the added bonus of picking their hours and work locations. (The Air Force Times estimates that drone maintenance pilots stationed overseas who work for companies like Raytheon can make as much as $225,000 a year) Since all the initial training and the security clearances are provided by the military, all the contractors are required to do is recruit Air Force veterans and then put them on their payrolls. By all accounts, the private contractors do not take part in making decisions as to who to kill nor are they allowed to fire missiles. But contractors do sometimes play a key role in military missions by the very nature of their analytical work. In 2010, Major General Timothy McHale identified an SAIC staffer who led a team of imagery analysts to track three vehicles in Daikundi province, Afghanistan. The information provided by these analysts led to some two dozen people being killed but later investigations would reveal that none of the people on board the vehicles were militants.